Points Nécessaires : 170 Please note that, for now, you cannot download content from our platform directly onto a mobile device (phone, iPod, iPad, tablets...). You need to download your items onto a PC or Mac, and then transfer them onto your device in the normal way. We are working on allowing direct downloads to mobile devices but this is not possible in the current version of the platform. Sorry about the inconvenience! Sam Spade was a hard-boiled detective with cold detachment, a keen eye for detail, and unflinching determination to achieve his own justice. The character of Sam Spade was created by writer Dashiell Hammett in 1930 for his crime story The Maltese Falcon, and for most people, the character is closely associated with actor Humphrey Bogart, who played Sam Spade in the third and most famous film versi… on of the story.In 1946 William Spier, one of radio's top producers, brought Sam Spade to the airwaves starring newcomer Howard Duff with Lurene Tuttle (and occasionally Sandra Gould) as Effie Perrine, Spade's secretary. Duff took a more tongue-in-cheek approach to the character than did the novel or movie. Dashiell Hammett lent his name to the radio series but did little more than cash the checks sent to him for the privilege.Scriptwriters were Jason James and Bob Tallman, who received an Edgar Award in 1947 for best radio drama from the Mystery Writers of America. Howard Duff starred as Spade until 1951 when Stephen Dunne took the role. 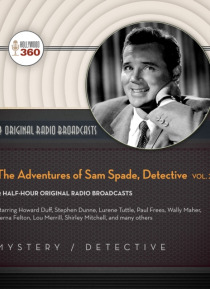 Starring here are Starring Howard Duff or Stephen Dunne as Sam Spade, with Lurene Tuttle, Paul Frees, Wally Maher, Verna Felton, Shirley Mitchell, Lou Merrill, and others.Episodes included in this collection are "e;The Bow Window Caper"e; (9 Nov 47), "e;The Critical Author Caper"e; (15 Aug 48), "e;The Sugar Kane Caper"e; (3 Oct 48), "e;The Overjord Caper"e; (5 Jun 49), "e;The Sure Thing Caper"e; (9 Feb 51), "e;The Soap Opera Caper"e; (16 Feb 51), "e;The Shot in the Dark Caper"e; (23 Feb 51), "e;The Crab Louis Caper"e; (2 Mar 51), "e;The Spanish Prisoner Caper"e; (9 Mar 51), "e;The Kimberly Cross Caper"e; (23 Mar 51), "e;The Vendetta Caper"e; (30 Mar 51), and "e;The Civic Pride Caper"e; (13 Apr 51).